A stackable bag of happy, holiday goodness, this gourmet gift basket is just brimming with an abundance of decadent delights. This gourmet gift basket is overflowing with a wide variety of our magnificent custom milk chocolates and decadent dark vegan chocolates making it the perfect gift basket for chocolate lovers of all ages this holiday season. A terrific holiday goodie bag for large groups, couples or sensational singles this Christmas, your loved ones won’t believe their eyes when they discover this assortment under the tree on Christmas morning. 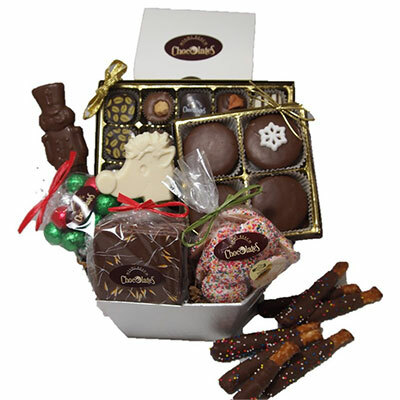 Featuring a variety of our most popular holiday treats, this gourmet gift basket contains a blissful box of 24 long chocolate dipped pretzels, a 15 piece package of tantalizing truffles, glorious genaches, and Christmas clusters, a beloved box of 4 chocolate dipped Oreos, a 4 oz. package of white Nonpareils, a package of 4 fabulous chocolate dipped graham crackers, a 4 oz. package of festive holiday ornaments, and 2 luscious lollypops (one milk chocolate and one white chocolate). You can even request to have your Stackable Bag gift basket include only decadent vegan chocolate if you wish.